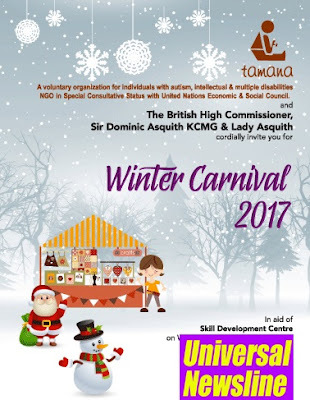 The Tamana Christmas Carnival will be held at the British High Commissioner’s residence on Wednesday 13 December. The inauguration of the carnival will be at 11:00am. Lady Louise Asquith, Mr. Sunil Sethi ( President FDCI) ,Mr. Kishore Jayaraman (President, India and South Asia Rolls Royce), Mrs. Krithika Jayaraman, Mrs. Neelam Rudy and Mrs. Ritu Mahajan will be present at the inauguration as the Guests of Honour. Dr. Shayama Chona (Padma Bhushan, Padma Shri Awardee, President Tamana) and Mr. Harsh Mahajan (Padma Shri Awardee, Chairperson Tamana) will also grace the occasion. The highlight of the ceremony will be the dance, music presentations and Christmas parade by the special needs individuals of Tamana who will take the platform to prove to the world that they are no different and given the right opportunity, love and nurturing they too can reach the sky. The Winter Carnival will have 150 exhibitors including established upcoming designers, artisans as well as NGOs showcasing lifestyle products. Other than being a one stop destination for all the shopping needs of the Delhiites, the carnival will also have food stalls by various popular food joints of the capital. To keep the children busy while parents shop, there will be a kiddies corner ‘Khel Gaon’ for the children. This has been aptly named so by Tamana Chona (National Awardee) the brand ambassador of Tamana NGO who is a primary school teacher and loves children. There will also be live performances by choir groups and individual performers to add to the festive atmosphere. Apart from the above mentioned stalls, there will also be exhibits by Tamana Skill Development units where products ranging from bakery & confectionery items, sun-dried fruits, herbs and mixes, personalised sublimated products, jewellery, gift bags among others made by the Tamana students will be available for sale. The carnival will not only be a a shopping extravaganza but an opportunity for the exhibitors and shoppers to contribute to a cause and do good while they engage in a joyous exchange of goods, fun and merriment.